Hello, dear readers. 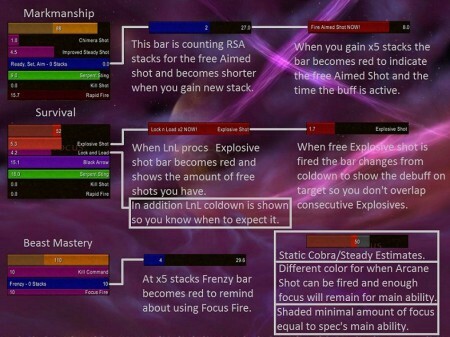 Today we will continue to talk about class add-ons for World of Warcraft. Let’s see what modifications are useful for Hunters. 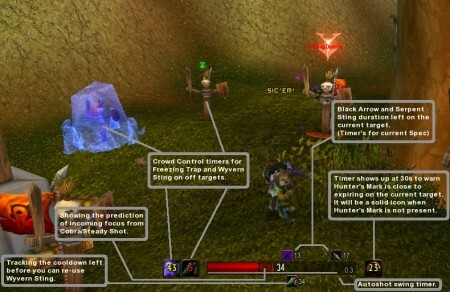 Bitten’s SpellFlash: Hunter is a SpellFlash module. It’s developed for Hunter specializations only. The add-on shows you what abilities are better to use at a certain moment to maximize your DPS or to increase your survival abilities. This modification makes a frame for trap spells, which is divided into nature groups. Thanks to this add-on your traps can be placed very fast. You can also see trap timers on the frame. FloTotemBar memorizes your actions and turns them into macros. In some cases this add-on will do certain actions by itself. It’s a useful add-on, which is very easy to handle. 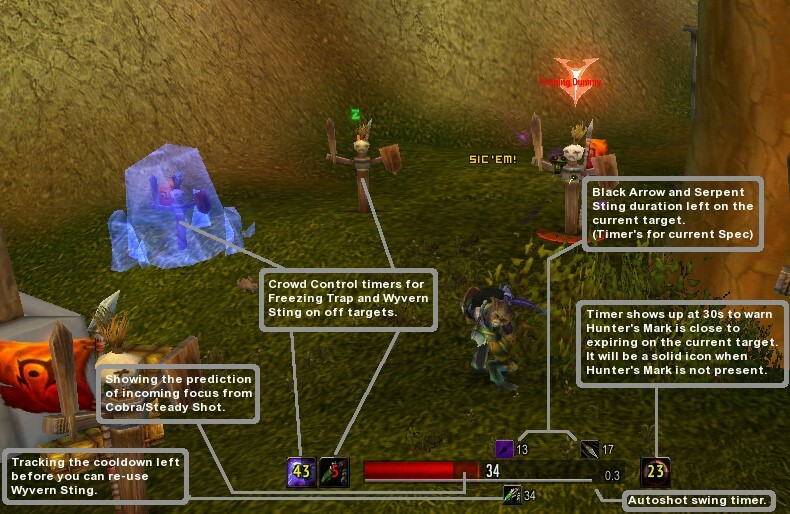 Its functions are to track your focus resource (with procs) and crowd control timers (for example, this modification shows the duration of your trap). Besides everything JSHB 4 does, it informs you whether there is no “Hunter’s mark” on a target or if it was dispelled. The main function of this add-on - its ability to prompt you at the right time to use this or that ability more efficiently. BadPet is a very convenient add-on, which makes your pets easier to control. For example, when you are raiding your pet will no longer attack the boss before the tank. This add-on is for Hunters only. When installed, it creates a new bar with Hunter’s cooldowns. 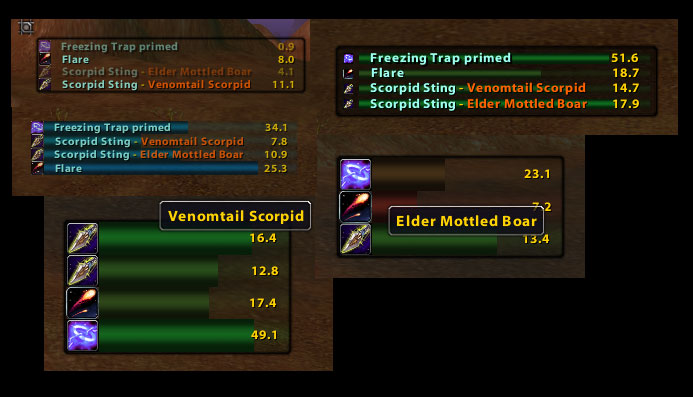 FloAspectBar changes the standard Hunter’s aspect bar by making it more convenient and informative. This add-on turns off the «Aspect of the Cheetah» and «Aspect of the Pack» if you got dazed. FaceShooter tells you what Hunter’s shot ability is better to use at a certain moment, taking into account your cooldowns and focus resource. By means of this add-on you can track both misdirection and tricks of the trade spells. 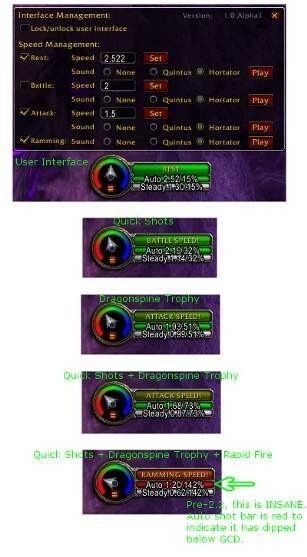 While SimpleMD is on, you can track all misdirection spells of your group/raid members as well as their (abilities) state. This modification is useful not only for Hunters, but also for raid leaders to track misdirection spells. Based on your current specialization it shows the most important abilities and stats. 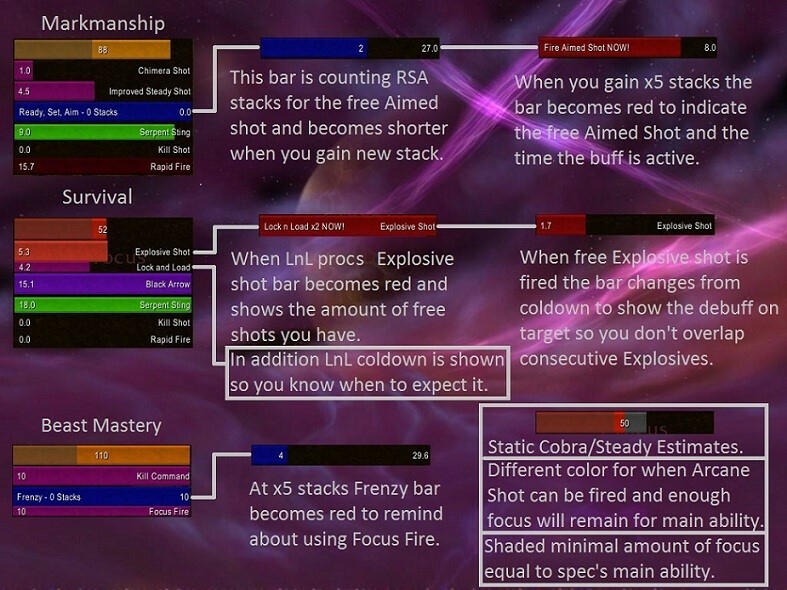 You can see the information on the bars, which every player can customize to his taste. You can also create some additional bars if it’s not enough for you. This modification creates dial frames, which look like a car speedometer. The frames indicate weapon haste speed, ability duration and so on. You can move them freely on the screen and at the same time they don’t require too much space. Of course there are more than enough of different modifications for Hunters. We have looked through the main add-ons in this article. We hope that you have learned something new for yourself and playing your favorite class became even more comfortable and interesting.